When you think of Germans, you don’t automatically associate 1980s soundtrack songs and a saxophone quartet. New Yorkers, this Friday, May 27th at Joe’s Pub prepare yourself for a “comedic character concert” like no other! 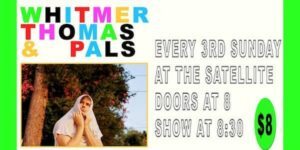 Actor, comedian, writer, and musician Tim Girrbach will play a version of his German Dad who reinterprets those 80s sounds, you’ve grown to love, dressed as Ferris Bueller. He’ll be accompanied by Manheim Tuttlingen, his Frauleins, and The Garden State Saxophone Quartet, a rockin’ wind instrument ensemble. Just some of the BIRTHDAY SAX soundtracks you’ll be treated to include Ferris Bueller’s Day Off, Back to The Future, The Goonies, Sixteen Candles & The Neverending Story. I know you’re feeling nostalgic already! Come out and join the lederhosen-sporting fun! Auf Wiedersehen! Mentions: Doors 9:00pm. Show 9:30pm. Buy tix HERE. Joe’s Pub is located at 425 Lafayette Street (at Astor Place) New York, NY 10003. Feature image by Christine Loy.